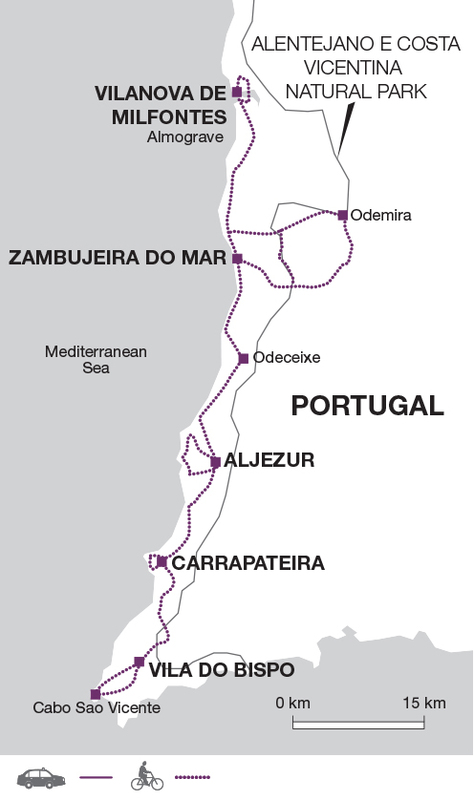 A self-guided cycle journey that follows Portugal's beautiful coastline from the Algarve into Alentejo. Pedal your way along dirt roads, crossing pastures and open vistas to Cape Sao Vicente, the south-westerly most point of continental Europe. Food and wine - Refuel on local specialities. Your holiday begins in the town of Vila do Bispo. The afternoon is free for you to explore the local sights and relax after the journey. After breakfast your bike will be delivered to your hotel. Take your time to test the bike out and make any adjustments before you start the first route. First you follow dirt roads across pastures and fields to Cabo Sao Vicente (the far southwest corner of Portugal). Then a quiet tarmac road takes you east along the rocky shores to the village of Sagres, which has a beautiful beach and several bars and restaurants. You will then return to Vila do Bispo for the evening. 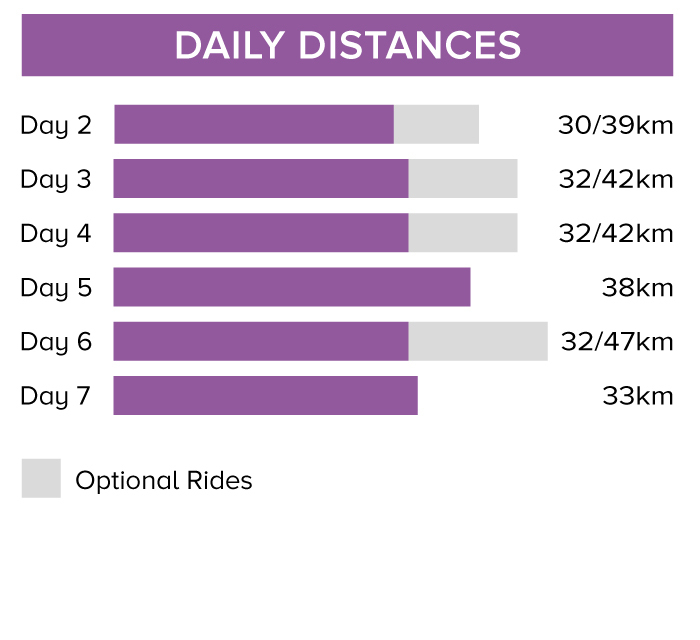 Your total cycling distance today is approximately 30 kilometres (200/ 275 metres ascent and descent) with the option to add a further 9 kilometres. Today you combine sections of three famous trails. You start on the Via Algarviana as you head west from Sagres, before turning north to catch up with the Historical Trail which leads to Carrapateira via the restored village of Pedralva. If your legs are feeling strong we recommend you add the circular route from Carrapatiera along the cliffs and beach as this is one of the most stunning beaches in the area. Your total cycling distance today is approximately 32 kilometres (300/ 400 metres ascent, 375/ 475 metres descent) with the option to add a further 10 kilometres. From Carrapateira you explore the rolling hills and quiet inland valleys with extensive pasture land and villages. After following the seaside plateau of Monte Novo and Chabouco for approximately 20 kilometres you descend to the medieval town of Aljezur. You can also choose to add a loop via the coastal village of Arrifana and the beach of Monte Clérigo. Your total cycling distance today is approximately 32 kilometres (275 metres ascent and descent) with the option to add a further 14 kilometres. Today is an enjoyable route as you cycle to Armoreiro beach, then climb up to a plateau filled with heather and pine trees at Rogil. After a short coffee break you will follow the Historical Trail alongside a winding irrigation channel, or alternatively you can choose to cycle along wider tarmac lanes. After the traditional village of Odeceixe you cross the border between the Algarve and Alentejo and start the second climb of the day, across an agricultural area to reach your accommodation for the night, set above the beach of Zambujeira. Your total cycling distance today is approximately 38 kilometres (225 metres ascent and descent). You may like to take it easy today and spend some time at the beach, or you can choose to cycle an easy circular route through the relatively flat agricultural area between Zambujeira and Sao Teutonio. However, we recommend you cycle the long route via Boavista dos Pinheiros in order to appreciate a different landscape along on the banks of the rivers Mira and Sao Teotonio. To reach the river banks you follow wide dirt roads (again waymarked as a Historical Trail) through undulating countryside with open woods of Holm Oak and Strawberry trees, bursting with flowers in Spring time. After Boavista dos Pinheiros, you can follow quiet tarmac and dirt roads back to Zambujeira. Your total cycling distance today is approximately 32 kilometres (275 metres ascent) with an option to add a further 15 kilometres. On your last day you mainly follow dirt roads and quiet tarmac lanes along the coast line. The end of the route is the magic Coastal town of Vila Nova de Milfontes, at the mouth of the river Mira. It has the nickname 'Princess of the Alentejo' and once you have stayed there you will understand why. This town is perfect for a few extra nights to enjoy the beach and the tasty gastronomy of the Alentejo. Your total cycling distance today is approximately 33 kilometres (150 metres ascent and descent). After breakfast the bike rental company will pick you up at the hotel and drive you to Faro Airport. Throughout the trip there are fantastic photo or sketching opportunities with expansive views and traditional Portuguese architecture. Day 4 - A particularly good beach today to visit is at Monte Clerigo. Bring cycling gear such as quick drying cycle tops, padded cycle shorts and cycle gloves. The sun can be strong in the south of Portugal though at the start and end of the season you should bring warmer clothes as the weather at these times will be changeable. A waterproof cycle jacket is recommended in case of rain. A light windproof jacket is always useful. We recommend outbound and inbound flights into Faro airport. The closest airport for this trip is Faro. Take a taxi from the airport to Faro bus station. From here you can take a bus to Lagos with EVA bus. From Lagos take a second bus to Vila do Bispo for the start of your trip. The total journey time is around 3 hours. At the end of the trip you have an included transfer (2 hours) from Vilanova de Milfontesto to Faro airport. An alternative private departure transfer can be arranged from Vila do Bispo to Faro airport at additional cost. During this trip you will cycle a minimum of 185 km during six days (and average of 26 km per day) with optional trips on most days. These cycling trips follow mostly well-surfaced tarmac roads and cycle paths. Inevitably, near the towns there is more traffic, but we have chosen alternatives wherever available in order to avoid busy roads. We have graded this trip as Easy to Moderate. 18 gear Coluer Rave Mountain Bike with lockable front suspension. Your included bike is an 18 gear Coluer Rave mountain bike with lockable front suspension and will be the correct frame size for your height. This bike is fitted with a map holder and one lateral rear pannier bag. Female saddles can be provided on request (please advise at time of booking). Alteratively you can bring your own saddle (please ask for seat stem size). A lock, pump, spare inner tube and puncture repair kit with tyre levers will be provided. All you need to bring is your own helmet. You will be required to sign an agreement of care on collection of the bike. Mon 1 Apr 2019 - Fri 31 May 2019 Your trip can depart anytime between the above dates. Contact us for triple room requests and solo traveller prices. Tue 25 Jun 2019 - Mon 15 Jul 2019 Your trip can depart anytime between the above dates. Contact us for triple room requests and solo traveller prices. Tue 16 Jul 2019 - Sat 31 Aug 2019 Your trip can depart anytime between the above dates. Contact us for triple room requests and solo traveller prices. Thu 25 Jun 2020 - Wed 15 Jul 2020 Your trip can depart anytime between the above dates. Contact us for triple room requests and solo traveller prices. Thu 16 Jul 2020 - Mon 31 Aug 2020 Your trip can depart anytime between the above dates. Contact us for triple room requests and solo traveller prices. Sun 1 Nov 2020 - Tue 22 Dec 2020 Your trip can depart anytime between the above dates. Contact us for triple room requests and solo traveller prices. Wed 23 Dec 2020 - Thu 31 Dec 2020 Your trip can depart anytime between the above dates. Contact us for triple room requests and solo traveller prices.